Tom Brady's stolen jersey from this year's Super Bowl has been recovered after being found in the possession of a member of the international media, according to the NFL. The league announced Monday that the New England Patriots quarterback's game-worn jersey from Super Bowl LI and another jersey, missing from Super Bowl XLIX, were retrieved after an investigation led by the FBI. The jerseys were found in Mexico and currently are being authenticated by authorities, Houston Police Chief Art Acevedo said. The Mexican Editorial Organization (OEM), a major newspaper publishing company, has identified the man allegedly involved in the case as Martin Mauricio Ortega, who was a director of one of its newspapers, Diario La Prensa, until he resigned last Tuesday. "I am happy my jerseys from SB 49 and SB 51 have been recovered, and I want to thank all of the law enforcement agencies involved. I know they worked hard on this case -- and it is very much appreciated. Hopefully when I get the jerseys back I can make something very positive come from this experience." OEM announced in a statement Monday that it accepted Ortega's resignation, citing his previous mentions of family health issues, and said it had no previous knowledge of his alleged involvement in the case. A Denver Broncos helmet, believed to belong to star pass-rusher Von Miller, from Super Bowl 50, also was recovered with the two Brady jerseys, sources confirmed to ESPN's Jeff Legwold. Officials currently are trying to authenticate the helmet. A law enforcement source told ESPN that authorities used footage from Fox, which showed Ortega entering the locker room and, with his back to the camera, reaching into Brady's bag and putting the jersey into a black plastic bag and leaving. Authorities went over approximately 20,000 credentials, and eventually settled on Ortega as a person of interest, leading to Monday's announcement. A source also told ESPN that authorities found stickers inside the helmet -- one each for the Army, Navy, Air Force and Marine Corps -- which led them to believe it belonged to Miller. "I am happy my jerseys from SB 49 and SB 51 have been recovered, and I want to thank all of the law enforcement agencies involved. I know they worked hard on this case -- and it is very much appreciated. Hopefully when I get the jerseys back I can make something very positive come from this experience," Brady said in a statement released via his agent, Don Yee. Acevedo noted during a news conference Monday that the jerseys are in the possession of the FBI in Boston, and law enforcement was working to authenticate them. Acevedo mentioned a "suspect" in the case but did not say whether anyone was in police custody. He also tweeted about the recovery of the jerseys. "Through the cooperation of the NFL and New England Patriots' security teams, the FBI and other law enforcement authorities, the Super Bowl LI jersey worn last month by MVP Tom Brady has been recovered," the NFL said in its statement. "Also retrieved during the ongoing investigation was the jersey Brady wore in the Patriots' victory in Super Bowl XLIX against the Seattle Seahawks in 2015. "The items were found in the possession of a credentialed member of the international media. Due to the ongoing investigation, we would refer any additional questions to the FBI." Following the Patriots' 34-28 victory over the Atlanta Falcons in Super Bowl LI, Brady immediately realized his jersey had been taken from a bag he had put it in in the locker room. "It's unfortunate, because that's a nice piece of memorabilia," Brady told the media a day later. "If it shows up on eBay or something, somebody let me know. I'll try to track that down. ... Those are pretty special ones to keep. But what can you do? I'll take the ring. That's good enough for me." A week later, Patriots owner Robert Kraft, on the Fox Business Network, compared taking the Brady jersey to "taking a great Chagall or Picasso." In its report, the Houston Police assigned a value of $500,000 to the jersey, the same number that sports auctioneer Ken Goldin, who has sold game-used Brady jerseys before, said he believed it was worth if it were to hit the open market. 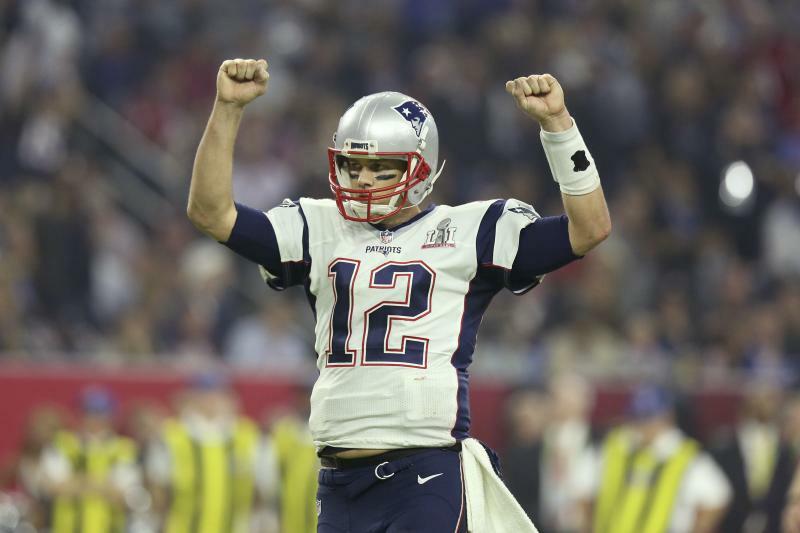 Game-used Brady jerseys from regular-season games have been sold in the $50,000 range. The Houston police classified the alleged theft of Brady's Super Bowl LI jersey as a first-degree felony. Fox Sports' Jay Glazer first reported NFL security and the FBI found Brady's jersey and were in the process of returning it to the Patriots. Glazer added the FBI became involved because the jersey was found on "foreign soil." He then reported the "NFL believes the jersey was stolen by someone posing as [an] international media member." Ian Rapoport of NFL Network reported the person in question is Mauricio Ortega, noting his newspaper will be releasing a statement on the incident. Rapoport, via Conor Orr of NFL.com, added Ortega is a former executive with La Prensa, a Mexican newspaper. Glazer later reported, via Will Brinson of CBS Sports, that the Denver Broncos believe Ortega "may have also taken Von Miller's cleats and jersey" after Super Bowl 50. I am happy my jerseys from SB 49 and SB 51 have been recovered, and I want to thank all of the law enforcement agencies involved. I know they worked hard on this case – and it is very much appreciated. Hopefully when I get the jerseys back I can make something very positive come from this experience. Brady's Super Bowl jersey became a hot topic of discussion following the Patriots' 34-28 overtime victory over the Atlanta Falcons. Brady was asked about the situation during his postgame press conference, saying, "I put it in my bag and then came out and it wasn't there anymore, so it's unfortunate because that's a nice piece of memorabilia. So if it shows up on eBay somewhere, someone let me know, try to track that down." Three days after the Super Bowl, a Houston Police Department spokesperson told A.J. Perez of USA Today they had assigned "several" investigators in an attempt to locate Brady's jersey. The police report from the Houston Police Department, which TMZ obtained, estimated the jersey to be worth $500,000. The Patriots' 25-point comeback over the Falcons on Feb. 5 gave Brady an NFL-record five Super Bowl wins as a starting quarterback. 0 Response to "Tom Brady's stolen Super Bowl jerseys found in possession of international media member"